This is an awesome meal combining two of my favorite foods. 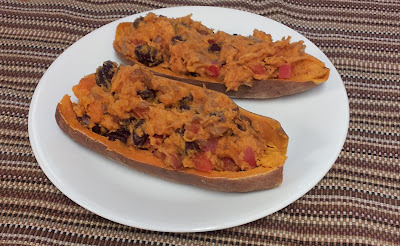 Sweet Potatoes and Chili. This is like a twice baked potato only I didn't bake them twice. It was hot enough so I didn't feel the need to stick them back in the oven. Actually, these technically might be yams. I really don't know which are which. I always thought that the orange ones were sweet potatoes and the white ones yams but someone just told me otherwise. I've seen these labeled at my grocery store as New Jersey Sweet Potatoes AND Yams so clearly they are confused as well. I like both but prefer the orange ones. This came together quickly and was super delicious and filling. And healthy! Day 2 of my 30 days of vegan recipes. This was a great way to start the weekend for dinner. Check out Elena's 30 day Body By Plants boot camp! Cook sweet potato in microwave or oven until soft and done. Slice in half and carefully scoop out the potato into a bowl. 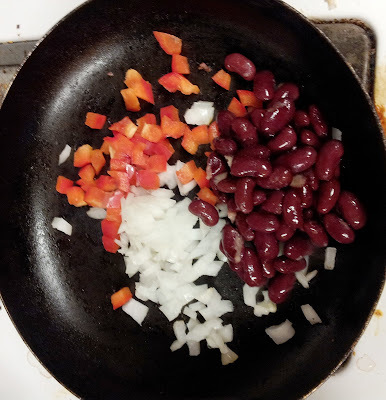 Combine kidney beans, onion and red pepper in a saucepan and saute briefly, just to cook the onion and and red pepper until soft. 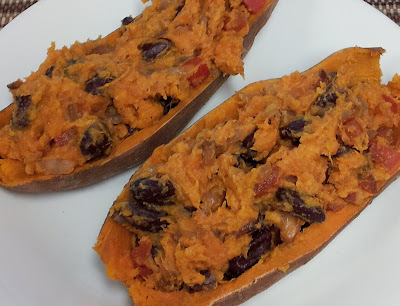 Add bean mixture to the sweet potato. Add seasoning, taste and re-adjust seasonings if necessary. Scoop back into potato skins and enjoy! You can throw the skins into the oven to crisp up a bit if you'd like but I didn't bother.